A Month with the Note 8: Can Samsung’s Phablet Replace a Laptop? For the better part of the past two decades, my job and life have revolved around always having a phone, a tablet or a notebook or two at hand for work and play. From gaming and movie watching to the more menial task of making a living, devices were my constant companions. For the past month, I have slimmed down my digital sidekicks considerably, using only a Samsung Galaxy Note 8. This experiment in living light encompassed everything I do, from writing (including this story), running my business and staying in touch with my far-flung family, to watching movies and sports, gaming, and making and listening to music. In other words, my whole life became tied to the Note 8. The key element in being able to consolidate my multidevice lifestyle into one phone was the Note 8’s DeX dock. This $122 add-on turns the $930 Note 8 into a full-fledged desktop computer, allowing me to ditch the other gear. DeX gives the Note 8 a split personality. On its own, Samsung’s latest flagship is a very capable, albeit large, phone for when I’m on the go. A few seconds after you slide the phone into the DeX Station, though, the Note 8’s battery begins to charge, while the phone automatically connects to an external display, keyboard, mouse and the internet. For this experiment, I attempted to use many of the same apps on the go and at the desk, without missing a beat. For instance, I started watching a baseball game on MLB At Bat during my commute and then connected with DeX to finish it on the big screen after I got home. Along the way, I had to make some compromises and change aspects of both my work and lifestyle to accommodate the radical reduction in gear. The payoff was a lighter load. If there’s one essential Note 8 accessory, it’s the DeX dock, which also works with Samsung’s Galaxy S8 and S8+. It’s an effective way to bridge the differences between a phone in your hand and that computer at your desk. About the size of a hamburger, the black DeX dock has rubber feet, so it won’t scratch your table. It snaps open to reveal a vertical USB-C plug in the middle for the phone. Along its back are connectors for HDMI, power, wired LAN and a pair of USB 3.0 ports. If that’s not enough, you can use a USB hub to add more ports. 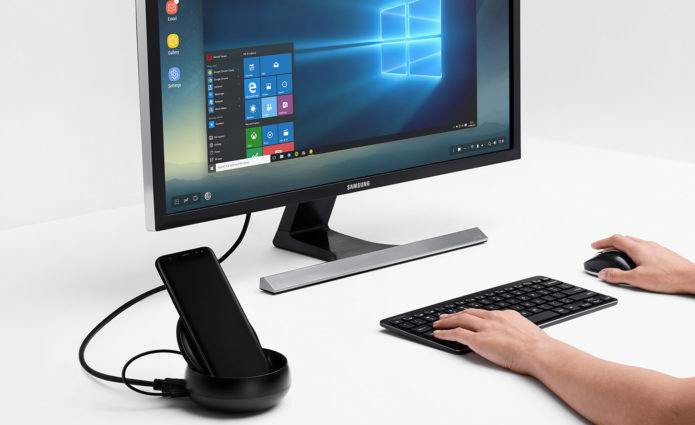 The dock uses the same AC adapter as the phone, and after plugging it into a 27-inch Philips monitor and a Logitech K400 wireless keyboard, I was nearly set. Pretty much the only thing the DeX lacks is an audio jack. I got around that by using a Braven 850 wireless speaker connected to the phone over Bluetooth. It not only sounds surprisingly good for music (more on that later), but when the phone rings, it turns the Note 8 into a speakerphone. If there’s one essential Note 8 accessory, it’s the DeX dock. Connecting the Note 8 with the DeX can be a little tricky, and I found myself having to move the phone around a bit to get the USB-C port on the phone to fit properly. About 5 seconds after you connect the phone, DeX gets to work. It converts what’s on the Note 8’s screen into a horizontal HD display and connects the keyboard and speaker. In other words, it’s an instant desktop. Sometimes the process doesn’t work that smoothly, though. A few times, the full desktop didn’t load or the screen remained black, only to recover in about 30 seconds; occasionally, I needed to do a soft reset on the Note 8 (power plus volume-down buttons) to coax the phone back to life. There’s no software to load with the DeX. It has a Settings page that lets you adjust the speed of the pointer and when the screen goes to sleep, as well as toggle which apps get resized. There’s also a bar at the bottom of the DeX’s desktop that provides access to volume, Bluetooth and other settings. But other than those settings, there’s very little to stand in the way of you getting things done using just your docked phone. All told, it took about 5 minutes to set up DeX on my desktop, and my biggest problem was that after moving my key data over to my phone, I wasn’t sure what to do with my old notebook. The Note 8 and the DeX work in tandem with just about any Android app out there, but I found that most apps didn’t run full screen using the DeX. Some let you decide between horizontal and vertical viewing, but neither option is ideal once you work with the dozen or so apps that have been enhanced for DeX. The 14 optimized apps include the Office trio (Word, Excel and PowerPoint), Photoshop Lightroom and Behance’s online portfolios. Office apps work surprisingly well from my Note 8 and run full screen in HD resolution. I do about 90 percent of my work in Word, Excel and PowerPoint, which look and act just like the Office 2016 apps I’m used to. The best part is that the Android versions are free to download. I’ve added them to my Office 365 account (which requires a subscription fee) to unlock the ability to track text changes; that also brought some advanced layout and formatting styles while letting me integrate the apps with my OneDrive online storage. The apps worked surprisingly well from my Note 8 and ran full screen in HD resolution. I was hard-pressed to tell the difference between the experience on the Note 8-DeX twosome and that on my old notebook. To start a new writing project, I just opened Word from the home screen, created a new document and (hopefully) let the words flow. The Word app has the features I use most (like bullets) as well as my favorite fonts. The app saves the file as the same .docx on a PC format, so I can send a project right from my Note 8 to a client. In addition to spending a lot of time compiling huge worksheets of product features, performance and specs, I use Excel every day as my bookkeeping tool to track assignments and invoices, as well as remind deadbeats who haven’t paid me. I generally update the sales and expenses sheets several times a day. I occasionally pitch business using PowerPoint to make and present slide shows. I have the choice of creating the shows on the naked phone or with the DeX and the accoutrements of my desk. Happily, when it comes time to give the show, I leave the dock on my desk. That’s because the Note 8 has three ways to connect with a projector or display without DeX. The quickest and clunkiest is to plug a USB-C video converter into the phone and run the video through an HDMI cable. But who wants to carry cables? I really like the Note 8’s ability to go wireless with the phone’s Smart View feature. After I pulled the main menu down from the Note 8’s screen and tapped Smart View to activate it, all of the nearby receivers appeared. My phone not only connected to a Chromecast receiver plugged into a Canon projector at a meeting, but later, at home, it turned on my Samsung TV and automatically linked to it. By tapping into my T-Mobile cellular service, my Note 8 can connect anywhere or rely on Wi-Fi for data. The DeX adds a wired networking connection to the mix. The Note 8 comes with Samsung’s browser built in alongside Chrome, but you can add other third-party browsing options, including Opera or Firefox. Although I’ve used Gmail on my phones for years, the Note 8’s 6.3-inch Ultra HD screen finally makes it much more workable for me than the 5.1-inch screen on my old Galaxy S6. Text on the Note 8’s display looks sharp and easy to read, while images appear to pop off the Note 8’s OLED panel. So now, instead of reading and only cursorily replying to emails, I use the Note 8 as a full email tool. I still hate the phone’s on-screen thumb keypad, though. I’m extra happy when I get back to my desk to dock the Note 8, where I have a full keyboard at my disposal. I love being able to watch videos (on YouTube), movies (on Netflix) or baseball games (on the MLB At Bat app). All three show up full screen on the Note 8. Netflix restricts you to a small screen with the DeX dock, while YouTube and At Bat run full screen, so I could see everything clearly. While we may be on the verge of a paperless society, I still print a lot of things and have the bulging file cabinets to prove it. The Note 8 can work with a variety of printers, but you’ll first need to load an extra app to do the dirty work. For instance, to print any of my photos on my Epson ET-16500 printer, I needed to have the Epson Print Enabler app installed; Brother, HP and other printer makers offer similar options. Though I’m not particularly good at it, I like to write music on my phone while I’m stuck on a train or have a few minutes to kill. The Note 8 and DeX dock let me do this, but with a twist. First, I got and installed Samsung’s Soundcamp, a free music-composing app that works well on the Note 8’s large screen. On its own, the Note 8 has a single octave keyboard that I can use to play the piano, add a bass line and even drop in a drumline, but its screen feels cramped. When I’m back at home, I plug my MIDI Plus AKM320 keyboard into the DeX’s USB port, and a new world of music opens. With two and a half octaves of keys as well as physical wheels for pitch and modulation control, my artistic urges can run wild, which is not always a good thing. I’ve been told not to quit my day job, and I’m better at listening to the music made by professionals. So I’ve loaded some of my favorite songs onto the 256GB microSD card that came with the Note 8. I also listen to Spotify with the Note 8 on the road or at home. After loading my account, I can listen to everything from Edvard Grieg to the Grateful Dead at home or on the road. Music sounds better at home with the Bluetooth-connected external speakers, but the Note 8’s included AKG earbuds are comfy and pour out rich audio. There’s a cool trick here, because buried in the Settings’ Sounds and Vibrations section is the Sound Quality and Effects category, which has not only a nine-band graphic equalizer (to add a little midrange and high end to the audio) but simulated surround sound and a way to soften the tones as if it were being boosted by a tube amp. It all sounds good to me. One of the big steps forward in communication with the DeX and Note 8 is that incoming calls show up on both my big display and the Note 8’s screen; all I have to do is click on a mouse (or, in my case, the K400 keyboard’s touchpad) to take the call or duck it. Happily, audio from the call gets routed to the Braven speaker’s microphone. Calling over cellular can be an expensive proposition for me with children in St. Andrews, Scotland, and Baku, Azerbaijan, but keeping in touch with them is paramount. Our preferred way to communicate is frequent video chats using Skype. DeX helps bring us together, because once the Note 8 is in the DeX dock, it can drive a big screen. But there are some snags involved. First, there’s less than meets the eye, because the Skype app hasn’t been enhanced for the DeX, and the video stream shows up as a small window rather than in full-screen mode. The bigger disappointment is that DeX aims the Note 8’s front camera at the ceiling, at best, or under my chin, at worst. I found that sliding a pack of Post-it notes between the Note 8 and the DeX could re-aim the camera closer to my face. I’m not a hard-core gamer by any means, but I do enjoy playing every now and again, particularly during downtime. With the Note 8, the first step is to load Samsung’s Game Launcher, which consolidates all your gaming into one folder. I’m not sure why Samsung doesn’t do this as the default setup, but it takes only a minute or two to configure Game Launcher. The feature not only stops annoying notifications but also fine-tunes how much of the Note 8’s potential you use. There are settings for Save Power (when you’re not plugged in to the DeX dock), Normal and, my favorite, High Performance. There aren’t a lot of games that have been enhanced to work with the DeX, but one that does benefit is Vainglory, which looked a lot better on a big screen than on the Note 8’s comparatively more constrained display. The game’s colors were bright, everything was sharp and the action never seemed to slow down. But I do have to admit I missed the finger-friendly nature of the handheld version while using the keyboard touchpad to play games. I also play games that are tamer, like Super Mario Run, Word Connect and Pinball King. The Note 8 opens a world of gaming, but I wish its catalog of optimized games were more extensive. My transition from being a multidevice user to relying solely on the Note 8 with an assist from the DeX dock went smoothly. I not only kept up with my far-flung family but did my job and stayed entertained along the way. The transition saved me from lugging around several pounds of gear when I traveled. In fact, I found that it was a little too easy to ditch a notebook and tablet. My month with the Note 8 was so successful that I’ve decided to keep it going. There’s so much the Note 8 and DeX have done to make my digital life and work easier to handle, but there’s much more left to do. The missing link remains the lack of apps enhanced to work with the DeX. If the DeX is to succeed and catch on, software makers need to embrace it as a standard and make it part of every new app. After exploring the ins and outs of the DeX and the Note 8 for a month, I’m hopeful that this will happen. But only time will tell.